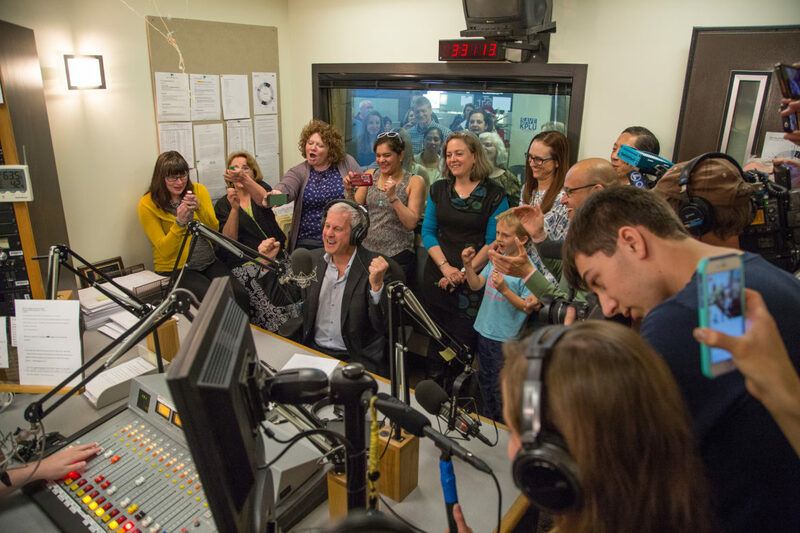 The staff of KNKX, then KPLU, celebrates raising $7 million to buy the station's license in May 2016. Employees at Washington public radio station KNKX are navigating the ups and downs of freedom from university ownership a year after their successful campaign to buy their independence. The Tacoma-based station reached its goal of raising $7 million last May to buy its broadcast license from Pacific Lutheran University. PLU’s announcement in November 2015 that it would sell the station to the University of Washington, which owns KUOW in Seattle, sparked a backlash among fans of the station. In response, PLU gave the management of KNKX, then KPLU, six months to match KUOW’s buying price. But after they succeeded in reaching the goal, their work was only beginning. Over the past year, KNKX’s employees have worked to finalize their status as an independent nonprofit and create a plan to sustain the station’s newfound momentum. Meanwhile they’ve enjoyed audience growth and continued strong financial support from their community — but that support has also brought raised expectations. KNKX is working to keep the momentum going. Last month the station formulated a draft five-year strategic plan calling for more community events, expanded coverage of regional news and music, an increase in video production and investing in new technologies such as NPR One and Amazon’s Alexa. Listeners probably haven’t noticed much change in the station’s news and jazz programming, but the familiar on-air sound hides big changes behind the scenes. “We’re still flying the plane and building it,” said News Director Erin Hennessey. As KNKX finds its footing, it’s not getting a free pass from supporters. After it reached its fundraising goal for independence, a major donor asked GM Joey Cohn how the station would handle its higher profile. It’s appropriate that KNKX’s call letters, chosen in August 2016, mean “connects.” “A big part of our thinking is, how do we pay the community back for saving us?” Cohn said. Moving forward, KNKX’s strategic plan calls for a focus on community, education and innovation, Martinez said. Over the next five years, the station aims to stage more free concerts and live public affairs events and host assemblies and performances in schools. It wants to establish an educational initiative to help students and community members tell the stories of members of their community. It also plans to deepen reporting in more communities in its coverage area. KNKX aims to launch a news program covering areas the station has previously given less attention, including South Sound and the Olympic Peninsula. The show will feature people “that we don’t hear a whole lot of on our air or on anyone’s air,” Martinez said. KNKX will also look to increase offerings of on-demand content, including podcasts. The strategic plan also calls for KNKX to expand its playlists, with less repetition of songs and a greater variety of genres. Over the past year the station has added two local programs focused on contemporary and Latin jazz. The station is also more able to make changes quickly, Martinez said, rather than navigate the university’s bureaucracy. “It has changed us for the better because we are able to operate on our own terms,” he said. Ariel Van Cleave, a Morning Edition producer at KNKX, was driving from Ohio to Washington to start a job at the station when she heard it could be sold. She decided to keep going despite having a guarantee of only four to six months on staff. At the new KNKX, Van Cleave has noticed more communication between news and jazz staffers as they consider how to strengthen programming and engage each other’s audiences. Hennessey said that she is “busier than ever” because the news staff has been brimming with new ideas since reaching the goal. Listeners appear to be responding to that energy. According to Nielsen data obtained from the Radio Research Consortium, KNKX’s average–quarter-hour listening grew by about 27 percent during the first three months of 2017 over the same period the year before. Average weekly time exposed to the station increased by one hour and 15 minutes over that same time period. And in April, the station reached a record 4.1 AQH share in the market. Seattle’s KUOW, once KNKX’s would-be buyer, has also enjoyed audience growth. KUOW saw a 39 percent increase in AQH in the first three months of 2017 compared to the same time period in 2016. Average weekly time exposed increased by an hour. Public radio stations in general have seen listening gains across the system. As KNKX moves ahead with expanding news coverage and other programming, it needs to hire “more staff than we thought we would need in terms of infrastructure,” Cohn said. So far it has hired a member services coordinator, an accounting assistant, a reporter to cover the South Sound and an editor/reporter. Cohn plans to recruit an operations director in coming months. The annual cost of the two reporters and operations director totals about $280,000. Under the strategic plan, eight more positions will be filled in coming years, including roles in news, video production and its streaming jazz service, Jazz24. Since its $7 million campaign for independence, donations to the station’s on-air drives have increased dramatically. KNKX raised more than $900,000 in its fall fund drive, double the amount it has typically raised. The spring pledge drive, which usually brings in $250,000, raised more than $400,000 this year. KNKX’s recent fundraising successes don’t surprise Melanie Coulson, a Seattle resident and executive director for member station services for Greater Public, the public media development consultancy. “People want to see them succeed,” said Coulson, a KNKX listener and former KPLU employee. And KNKX has successfully persuaded listeners that it continues to need support beyond its $7 million goal to operate independently, Coulson added. To longtime listener Frank Catalano, KNKX has “doubled down on what makes them unique.” A Seattle resident and executive at an education technology company, Catalano decided to double his donation this year as a token of his happiness with the station. When the station’s sale seemed imminent, Catalano said, he worried that “a lot of the things that make what is now KNKX fun and different than a lot of dry and traditional public media would go away. And that has been maintained and actually expanded.” KNKX often features a “quirky sense of humor” and banter among hosts, said Catalano. One of the biggest difficulties the station has faced is developing the back-end infrastructure previously furnished by PLU, including human resources and payroll systems. KNKX must also find a new home. The station negotiated an agreement with PLU to continue operating from its on-campus studio through June 2019. The search for a new headquarters will require KNKX to launch a capital campaign just a year after raising the money to buy its license. The station has called on a mix of paid and pro bono consultants to help with the transition. Cohn also sought advice from Neil Best, GM at KUNC in Greeley, Colo., who led his station to independence in 2001. The station raised $2 million in 20 days to buy its license from the University of Northern Colorado. KNKX took an important step by not making its campaign of independence about saving employees’ jobs, Best said. Instead, it focused on what makes the station unique in the market. Maintaining a distinct identity from its former university owner has also been important, Best said, and was strengthened by its adoption of new call letters. Best said he regrets that he didn’t make the same decision when KUNC became independent. Community members still assume that the station has ties to the school. KNKX now faces the “heavy responsibility” of a station rescued by its community, Best said. “You really feel the weight, the blessing and the weight, of not screwing up,” he said. Please KNKX, stay with NPR!!! How much funds did jazzz24 earn in this year’s funder drive?